We are a trustworthy enterprise in this domain, devotedly committed towards offering Semi Gantry Cranes. 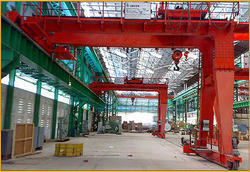 The offered gantry cranes find wide usage in construction and engineering industry. 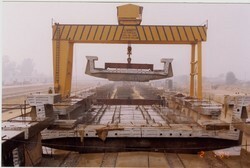 We design the offered gantry cranes by utilizing the excellent quality material and leading techniques keeping in mind the set norms. 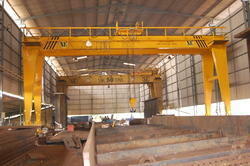 Additionally, we are giving these gantry cranes only after checking properly against numerous parameters. We are the leading manufactures and suppliers of Semi Gantry Cranes in Coimbatore, Mettupalayam, Salem, Tirupur, Pollachi, Trichy, Salem, Erode, Madurai, Tirunelveli , Chennai, Nagarkovil, Kanniyakumari, Tuticorin, Namakkal, Vellore,Theni, Dindugul, Ooty, Kunoor, Valparai, Kodaikanal, Kannur, Kozhikode, Malappuram, Palakkad, Wyanad, Kasargod, Kalpatia, Thrissur, Eranakulam, Iduki, Kootayam, Alapuzha, Kollam, Thiruvananthapuram, Patmanathitta, Kurnool, Anantapur, Cuddapah, Nellore, Chitoor, Prakasam, Guntur, Krishna, West Godaveri, East Godaveri, Vishakapattinam, Chikmangalur, ChitraDurga, Hassan, Tumkur, Mandya, Bangalore, Kodagu, Mysore, Kolar, Tamilnadu, Karnataka, Andrapradesh, Kerala and India..
Our company is engaged in designing, manufacturing and supplying of Gantry Cranes or Goliath Cranes, which are adapted to applications where overhead runways would be very long, costly to erect, and difficult to maintain in alignment. These cranes are easy to install and cost effective to extend the length of the runway and thus increase the working area of the crane. Gantry Cranes can be easily moved to a new location with less trouble or expenses than an overhead crane and its runway. Usually most of Gantry Crane installations are at outdoors. The range of Gantry Cranes manufactured by us in compliance with international quality standards and norms. These Goliath / Gantry Cranes are designed according to the specific dimensional clearance and technical need of the customers. We are the leading manufactures and suppliers of Gantry Cranes in Coimbatore, Mettupalayam, Salem, Tirupur, Pollachi, Trichy, Salem, Erode, Madurai, Tirunelveli , Chennai, Nagarkovil, Kanniyakumari, Tuticorin, Namakkal, Vellore,Theni, Dindugul, Ooty, Kunoor, Valparai, Kodaikanal, Kannur, Kozhikode, Malappuram, Palakkad, Wyanad, Kasargod, Kalpatia, Thrissur, Eranakulam, Iduki, Kootayam, Alapuzha, Kollam, Thiruvananthapuram, Patmanathitta, Kurnool, Anantapur, Cuddapah, Nellore, Chitoor, Prakasam, Guntur, Krishna, West Godaveri, East Godaveri, Vishakapattinam, Chikmangalur, ChitraDurga, Hassan, Tumkur, Mandya, Bangalore, Kodagu, Mysore, Kolar, Tamilnadu, Karnataka, Andrapradesh, Kerala and India..
We are leading manufacturers and suppliers of Goliath Crane to our clients.goliath crane are fabricated using premium quality raw material and designed using latest CAD facility to suit the clients requirements. Our engineers and researchers carefully study and do detailed analysis of clients requirements before deciding the suitable design. This enable us to reduce cost by designing optimum goliath crane designs, minimum crane structural weight, wheel loads headroom and clearances. We are the leading manufactures and suppliers of Goliath Crane in Coimbatore, Mettupalayam, Salem, Tirupur, Pollachi, Trichy, Salem, Erode, Madurai, Tirunelveli , Chennai, Nagarkovil, Kanniyakumari, Tuticorin, Namakkal, Vellore,Theni, Dindugul, Ooty, Kunoor, Valparai, Kodaikanal, Kannur, Kozhikode, Malappuram, Palakkad, Wyanad, Kasargod, Kalpatia, Thrissur, Eranakulam, Iduki, Kootayam, Alapuzha, Kollam, Thiruvananthapuram, Patmanathitta, Kurnool, Anantapur, Cuddapah, Nellore, Chitoor, Prakasam, Guntur, Krishna, West Godaveri, East Godaveri, Vishakapattinam, Chikmangalur, ChitraDurga, Hassan, Tumkur, Mandya, Bangalore, Kodagu, Mysore, Kolar, Tamilnadu, Karnataka, Andrapradesh, Kerala and India..